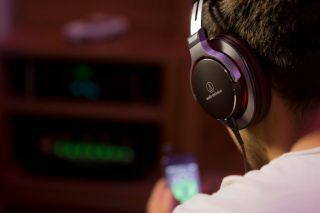 Audio-Technica unveils MSR7 headphones | What Hi-Fi? Audio-Technica has released a new pair of over-ear headphones, the ATH-MSR7, which the company says will get the best out of high-res audio. Designed for all scenarios, the ATH-MSR7s feature memory-foam ear pads to provide a secure fit, and can be used for longer listening sessions. A newly designed housing is also here: featuring "specially shaped" ear-profiled grills that mirror the entire ear to "enhance the rich, lower-end sounds". Audio-Technica is keen to push the merits of the cans when it comes to delivering high-res audio. The MSR7s use 45mm "True Motion Hi-Res Audio Drivers" in a bid to maximise the quality of high-resolution audio from, say, the Award-winning Sony Xperia Z3. Benefiting from a combination of a precision diaphragm and an extra lightweight voice-coil, Audio-Technica says that "response times are improved, while sound distortion is minimised to deliver a smooth, rich and detailed presentation". Elsewhere in these tech-laden cans you'll find 'Dual-layer Air-Control Technology'. This claims to enhance mid to low frequency sounds thanks to a specially designed construction: aluminium and magnesium layers are said to be lightweight but solid with the intention of reducing unwanted vibrations. The MSR7s come supplied with two 1.2m cables: a standard version and a version for use with iOS and Android devices. A 3m cable intended for use at home is also provided and there's a carry case, too. The Audio-Technica MSR7 headphones will be available from December in Gun Metal, Black or Red finishes for £199.